The Megan racing Subframe brace is light weight and yet extremely strong. 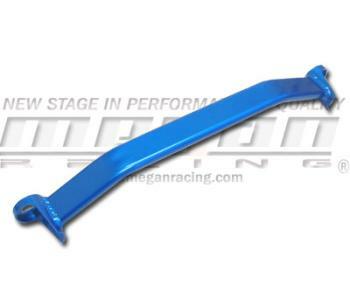 Designed to give your subframe strength where it needs it the most, this bar ties together underneath your differential and prevents your subframe from compressing and decompressing laterally. Made of light-weight aluminum and powedercoated a brilliant blue for durability against the elements and a nice finishing touch to the underside of your car, this product is definitely a must for those who know the true value of suspension tuning in their performance machines.